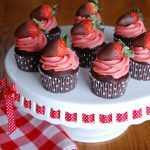 Decadent chocolate chip cupcakes topped with strawberry buttercream frosting and a chocolate dipped strawberry! CHOCOLATE CUPCAKES: Preheat oven to 350 degrees Line two 12-count muffin pans with 16 cupcake liners; set aside. In a large mixing bowl, sift together the flour, cocoa powder, baking powder, baking soda, and salt. Whisk in the brown sugar and granulated sugar until well combined. Then whisk in the oil, buttermilk, egg, and vanilla extract and mix until just combined. Add the instant espresso powder to the 1/2 cup boiling water and mix until fully dissolved. Add to the mixing bowl and mix until everything is just combined. The batter will be thin, this is okay. Evenly distribute the batter between all 16 cupcake liners, making sure to fill each one a little over halfway full. Bake for 16-18 minutes or until a toothpick inserted into the center of the cupcakes comes out clean. Remove from the oven and carefully transfer cupcakes to a wire rack to cool completely. STRAWBERRY BUTTERCREAM FROSTING: In the bowl of a stand mixer fitted with the whisk or paddle attachment beat the butter until smooth. Add the confectioners’ sugar one cup at a time, making sure to mix in each addition until fully combined. Add the freeze-dried strawberries to a blender or food processor and blend until powdery. Then, mix the freeze-dried strawberry powder into the frosting. Add the heavy whipping cream, vanilla extract, and salt until fully combined, stopping to scrape down the sides of the bowl as needed. Add more whipping cream if the frosting is too stiff. Fill a large pastry bag fitted with a 1M tip with frosting. Pipe cooled cupcakes with frosting. CHOCOLATE COVERED STRAWBERRIES: Line a large baking sheet with parchment paper; set aside. Melt chocolate and coconut oil in a small microwave safe bowl on 50% power in 30 second increments, stirring between intervals, until melted and smooth. Dip each strawberry into the chocolate one at a time and place on the prepared baking sheet. Transfer to the refrigerator until the chocolate has hardened. 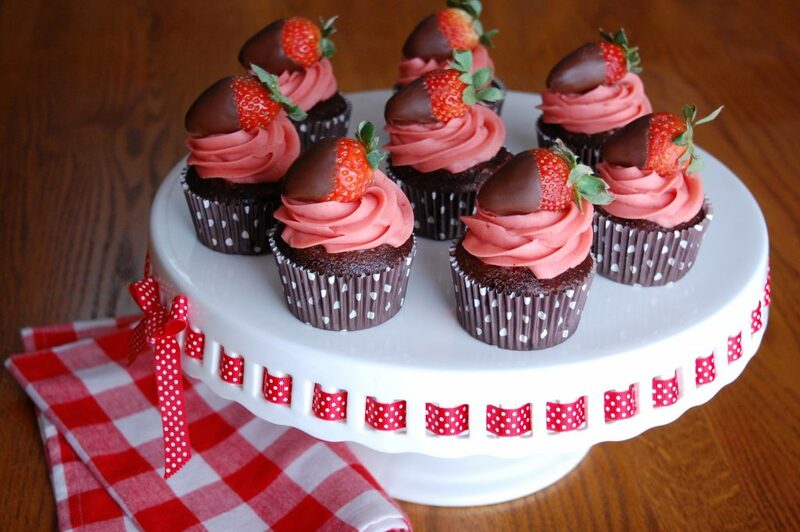 Top each cupcake with one of the chocolate covered strawberries.